High ambitions, and a corresponding ‘mission achieved’, distinguish reedman François Carrier’s “Traveling Lights”. 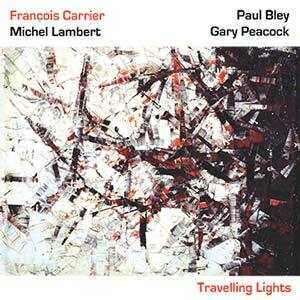 Two icons, Paul Bley and Gary Peacock were invited to join the younger Carrier and his frequent musical partner, drummer Michel Lambert, in a recording session of freely improvised music. Starting out as a supremely lyrical bop pianist in Montreal, Bley created an avant-garde pianism that is a polar contrast to Cecil Taylor’s percussive keyboard. Bley’s spare, contemplative playing is simultaneously radical and outright gorgeous. The same statement applies to Peacock’s bass. Both musicians are supremely versatile across the spectrum of jazz styles, and have played with a corresponding spectrum of top international talent. Phil Woods’ distinctively clean and clear alto sax first attracted a teenaged Carrier in to jazz. He set a trajectory from outlying Chicoutimi to the Conservatoire de Québec, the Vancouver jazz scene and then testing his mettle by playing alongside top New York and European talent. Carrier has done Woods proud by taking this spare and beautiful reed style into the avant-garde. Bley and Peacock are logical partners. The eight tracks are relatively short for free improvisation, especially for a collaboration of two dynamic duos that have not played together before. The fact that the musicians find each other so efficiently is testament both to their skills and the shared international language of jazz. The music proceeds mostly at a stately but intense pace, with periodic rapid clips that remind us that the tiger is there but voluntarily restrained at this time and place. Highly, highly recommended. Pianist Paul Bley is featured on two new releases, one a group session and the other unaccompanied. Nothing To Declare (Justin Time) contains only four pieces, but on these compositions Bley gives the audience a crash course in jazz styles and history. The almost 20-minute opening number shifts between blistering phrases and softer ones, mixing octave leaps and thrusts with lengthy periods where first the left and then the right hand dominates in the solo. “Breakdown” ventures to the outside while “Blues Waltz” explores both the 12-bar form and many subtle variations, and “8th Avenue” whirls through swing and back into bop and beyond. Bley has never concerned himself with rigid rhythmic definitions of swing, so there are many moments when he ventures into odd tempos or starts, then stops and reconfigures a solo. However, his technique is also quite amazing, and there’s no time during Nothing To Declare that he ever does the expected. The same holds true for the completely improvised set Travelling Lights (Justin Time), which has Bley operating in a quartet with bassist Gary Peacock, alto/soprano saxophonist Francois Carrier and drummer Michel Lambert. During the ’60s, they called this type of recording “avant-garde,” mainly because no one could think of a better name to describe music that didn’t seem to have fixed starting and ending points. While each song was written by a band member (most by either Carrier or Peacock), the compositions only contained very elemental musical structures because you can clearly hear Peacock and Lambert in particular frequently scrambling and responding to a Carrier solo or a Bley reaction on such songs as “Europe,” “Oceania” and “Americas.” Bley’s alternately slashing and light licks and careening solos add a second intriguing quality to the session, which gets propelled by Carrier’s bursts and flights on both saxophones. This isn’t quite as frenetic or experimental as late Coltrane or Albert Ayler material, but it comes about as close as anyone has in many years to replicating that same sense of adventure and abandon.